﻿During the Easter holidays we took a trip up to the Lego store in Glasgow. They were running a find the bunny competition and we entered ... a few weeks later, i received an email saying "Congratulations, you won a prize"
Safe to say Agent M was beyond excited. With 15 minutes to spare before the train, we went for a much needed caffeine top-up for Mama (which of course means a Chocolate babychino for Agent M). 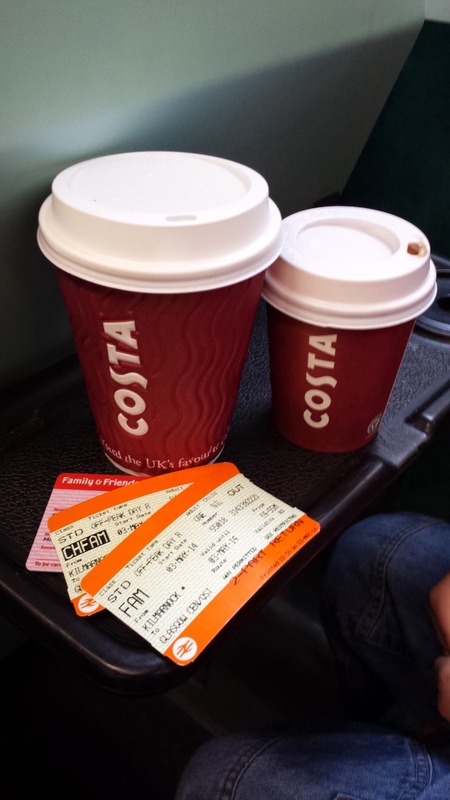 These little 50p hot chocolates are his favourite cause according to him, "its like [he's] got a grown up drink but with chocolate". Just wait till he discovers a White Chocolate Mocha. 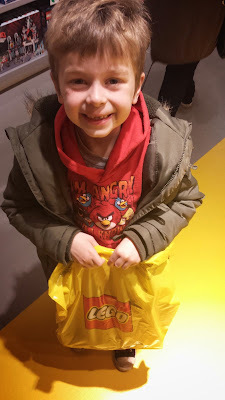 We get to the Lego shop and, if I'm completely honest, I'm expecting him to get a little figure or a keyring or something small like that. I mentally calculated how much money i had to skim off the food budget to fund today's trip and had ear-marked £6 for the pick-a-brick wall to make the trip worth it to him. 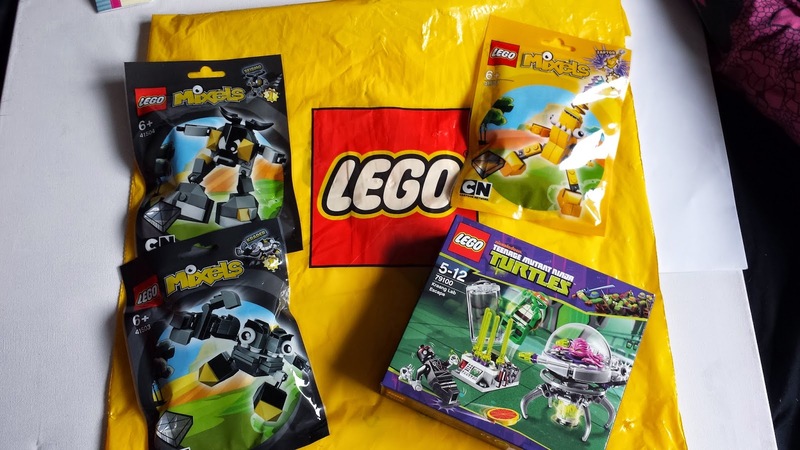 We find one of the staff and explain to her about the email which we showed as proof that he won and she says to Agent M that he has £20 to spend on Lego. That was the last thing i expected him to get. His little head almost exploded as he started to look about to see what caught his eye. Boom! Straight to the Ninja turtles section to pick out something ... "is this one ok?" he asks the woman. "yeah ... what else would you like?" and i can see his eyes widen as it starts to sink in that he's not limited to one small thing like normal. "Can i maybe have a mixel too?" "You can have 3!". At this point I'm not sure if Agent M is about to hug this woman or burst into tears cause hes so happy. Now, Agent M isn't the only Lego fan we have in our home. Agent D is like a big kid and has boxes of bricks and technics all of his own. My living-room looks like we could own shares in the stuff :) ... so not wanting to waste an opportunity, we decided to take advantage of being up in the city by getting him a set for his birthday. Big bonus is that they were running a 15% off selected Star Wars sets as part of their "May the 4th be with you" promotion. This day is getting better by the second!! So Agent M takes his role of Lego connoisseur very seriously and starts looking at the different sets. Having the sense to realise that the giant R2-D2 is probably out of our price range he finds a set that we can manage and we go to pay. "Oh you get a free poster with the set" ... Brilliant (Agent M already got one so now does Agent D). "and cause the amount spent you get a free gift" ... Seriously??? Am gonna get detained for theft at this rate with these freebies lol. Paid and bagged we go to leave when Agent M spots two Star wars characters and asks to get his photo taken with them. We get one and leave a very happy pair. Since we were making a day of it, he was asked where he wanted to go next. "I'm hungry ... how about a McDonald's?" ... hmmm hes after another toy. Fair enough i suppose, its a day for treats after all. 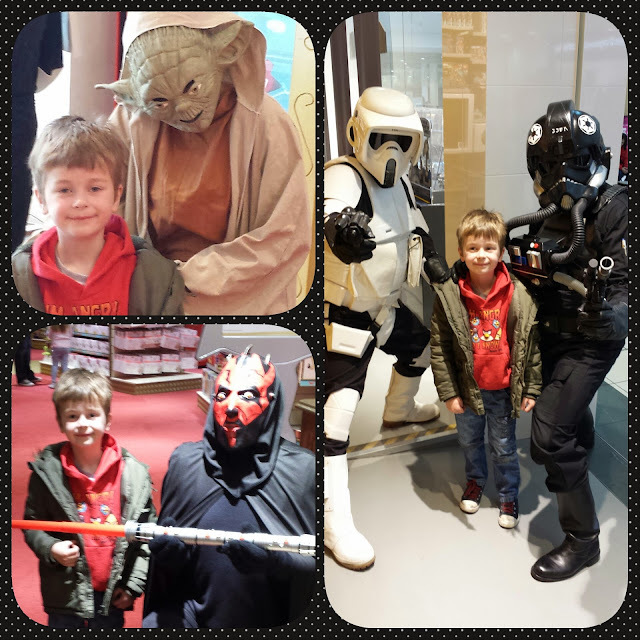 So we walk down to the St Enoch centre to get food and we keep seeing all these kids in Star wars costumes. We go to get food and his "toy" is actually a Enid Blyton book (which to be honest he seemed alot happier with). I guess I'm one of the lucky few who's kid values books. Above us is Hamley's the big toy store, with posters about Star Wars and all these little costumed kids are going in so we take a walk up after lunch and he meets 2 more characters and gets his photo taken. Inside he gets to play with loads of the toys they have out, including a remote control R2-D2.